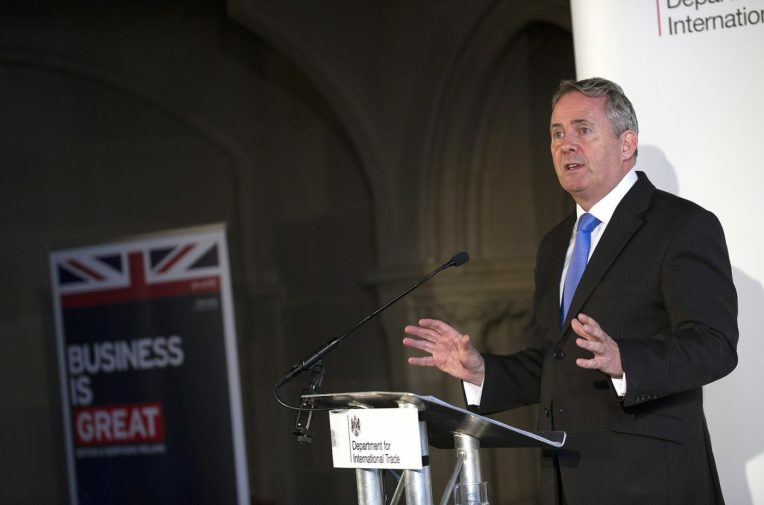 Liam Fox’s department for international trade has signed agreements with the US which will make it much more difficult to find out what is being discussed in early-stage US-UK trade talks. Fox’s department last week quietly released an exchange of letters between the UK and the office of the US trade representative agreeing to mark exchanged information, papers and discussions as either “sensitive” or “confidential”, with both sides also agreeing to keep the information “held in confidence” for four years after the conclusion of the talks. The US-UK trade working group has a mission to “lay the groundwork for a potential future free trade agreement” as well as discussing ways to strengthen UK-US trade ties during the Brexit discussions. This has led to concerns from politicians and campaign groups that the talks could pave the way for the UK to accept lower US standards on issues including animal welfare, chemical and pesticide usage, and other practices. Fox’s department formally agreed to tighten the rules on information handling two days after the trade secretary made a public pledge to boost transparency during the talks. During an interview with the BBC’s Today programme, Fox said he intended to learn the lessons of the backlash against the Transatlantic Trade and Investment Partnership trade deal, better known as TTIP. It was negotiated between the EU and US amid heavy secrecy. Talks have subsequently largely stalled amid high-profile public protests. “Consumers will want to be consulted. We don’t want to get into a situation where we’ve been with the TTIP agreement with the US and the EU where a huge amount of work is done only to find the public won’t accept it,” said Fox on 7 November. The pushback against public access to information on the US-UK trade talks comes as environment secretary Michael Gove insisted on Wednesday that MPs would have the power to vote down any deal if they believed it would lead to weakened animal rights standards. The letters were also signed less than two weeks after Unearthed revealed through information obtained through US Freedom of Information (FOI) laws that Fox’s 27-strong UK delegation to the first US-UK working group meeting was lacking in any experts with substantial trade discussion experience. In contrast, the US team was 77 people strong and included at least 20 officials with direct experience of negotiating and enforcing trade deals. The agreements are likely to make it harder – but not impossible – for journalists and the public to gain information on the talks through FOI law, according to an expert. Professor Heather Brooke of City, University of London, and an expert on FOI laws, told Unearthed: “The FOI law sets a default for openness but with these documents, the government instead set the default at ‘secret’ and only in a few exceptions will the public get a look,” she said. The concerns around limiting the scope of FOI laws comes against a backdrop of very few requests being granted by key departments handling the UK’s exit from the EU. Research by the Institute for Government showed that the Department for Exiting the EU granted in full just 15% of requests – the lowest proportion of any department – followed by the Cabinet Office and Foreign Office. Both departments are closely involved in the Brexit process. Tamasin Cave, the director of Spinwatch and the Alliance for Lobbying Transparency said Fox’s departmental actions mirrored government efforts to avoid parliamentary scrutiny of Brexit, and so raised significant concerns about what could happen behind closed doors. “These are ideal conditions for corporate lobbyists: loads of opportunity to craft deals that benefit their bottom line, while under a cloak of secrecy,” she said. “It is perfect for what David Cameron once called the ‘cosy club at the top making decisions in their own interest’. Typically, information marked as “sensitive” or “confidential” in the US would be subject to strict requirements on its storage, and who it could be shared with. The letters from Fox’s department exempt trade discussions from many of these requirements, but they are still treated as classified for the purposes of public disclosure. This has prompted campaign groups and open government experts to suggest the main aim of the letters is to prevent access to information to the media and broader public. “Trade deals affect huge parts of our lives, from the food we eat to the public services we rely on, so the presumption should be that everything is public, rather than the opposite,” Nick Dearden, director of Global Justice Now, told Unearthed. “Instead, if the US and UK wanted to give the impression of unaccountable ministers conspiring behind closed doors to promote business interests, they could scarcely have done better than this. Unearthed contacted the Department for International Trade with the concerns raised by the groups above, and asked for any comment it had on the reasons for the agreements to control access to information on the working group’s talks.